Plaster has been used on structures around the world for millennia, including the pyramids of Egypt and the ancient temples of Greece. The principles of plaster have remained relatively unchanged since its early days, with lime or gypsum and water mixed together with a binder such as sand, horse hair, and now hemp to produce everything from a wall surface to highly ornate architectural elements. Plaster works executed centuries ago still survives today, showing the strength and durability of the material. Giovanni Primo Casci of Barga, Italy, came to the U.S. in 1921 and traveled the country molding and installing plaster. 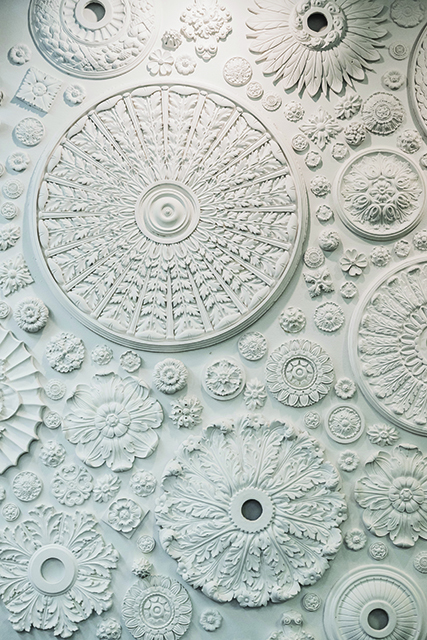 In the 1930s, he settled in Dallas and formally incorporated Casci Ornamental Plaster, which had a profound impact on interior architecture in Dallas. His work can be found all over, including almost every large historic home in such neighborhoods as Swiss Avenue and Kessler Park, as well as those throughout the Park Cities and Preston Hollow. Besides homes, his work is in the Georgian Revival buildings of Southern Methodist University, the Magnolia Building downtown, the Scottish Rite Temple ballroom, the DeGolyer house at the Dallas Arboretum, and even the Hall of State at Fair Park. In 1972, Casci sold the business to Royce Renfro but stayed on until his death in 1983. Renfro sold the business in 2017 to Mark Marynick and Porter Fuqua, Assoc. AIA, two longtime friends in their early 30s who love art and architecture. They did not want to see the venerable business close and saw the potential in the ancient craft of plasterwork in a modern world. Pick your column, pick your capital! 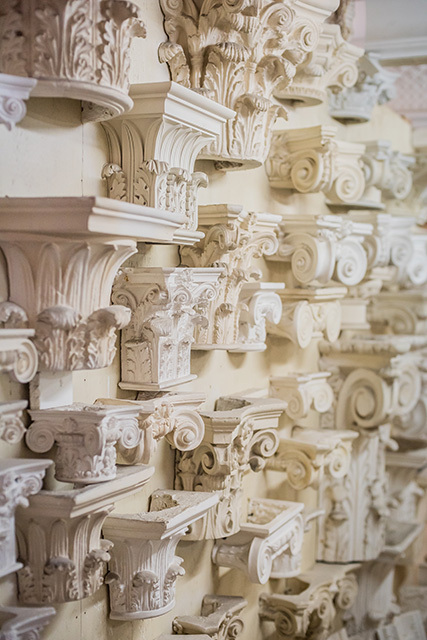 Casci Ornamental Plaster can create an endless array of capitals. Marynick has since bought out Fuqua and is working to keep the legacy of Casci alive while organizing and modernizing the business operations. However, the techniques for the plasterwork that Casci used and even his tools from Italy are still in use today with little change. The most recent upgrade, Marynick said, are the molds for the plaster pieces, which have gone from sand and animal fat to silicone and urethane. Casci has 12 craftsmen, one of them there for 25 years. The craftsmen are given a lot of autonomy on projects and work closely with architects, interior designers, and clients to achieve the desired outcome. Once the design is finalized from shop drawings or test molds, the process is straightforward. The raw material for the plaster is mixed with water to form a thick, almost liquid substance that is layered into the mold, with binders added to give it strength. After the plaster hardens, the piece is removed from the mold to fully cure before installation. Once installed, it can be coated with any number of finishes. 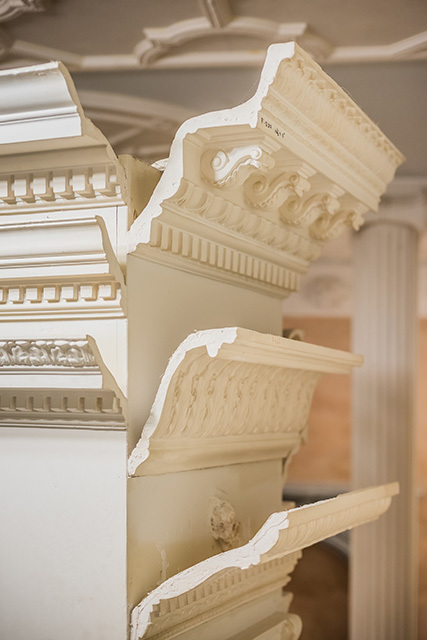 Clients can also choose from over 6,000 molds ranging from crown moldings, mantels, ceiling medallions, capitals, air vents, and more. 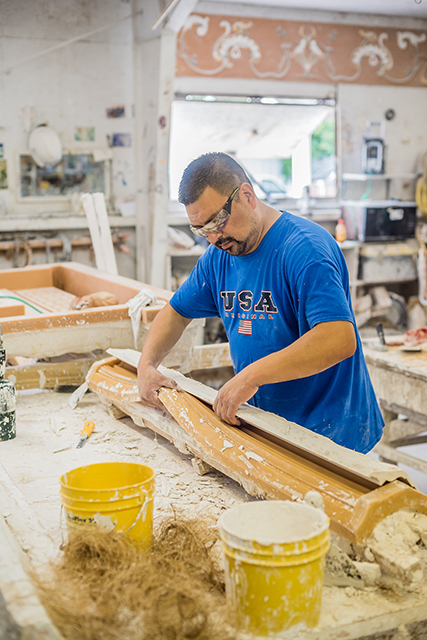 One of the craftsman at Casci Ornamental Plaster is working on removing the silicone mold from a crown moulding piece. The hemp on the table is used as a binder for the plaster. Plaster is also a green product, Marynick said. “There is surprisingly little waste. Unlike carving wood, which is a subtractive process from the raw material, plaster is an additive process, with the raw material added to a mold to create the desired effect using only what is needed for the project,” he said. So what is the future of plaster in modern architecture? Marynick expects it to be around for a long time, especially as quality wood becomes more scarce and expensive. “We can create the same design as wood, whether it be for a period home of classical design to that of a modern residence,” Marynick said. Casci’s recent and upcoming projects span the gamut from restoring plasterwork in the Dallas County Records Building to adding a light cover to the plaster dome in First Presbyterian Church to creating custom pieces for new construction. With Marynick’s vision for Casci, plasterwork should live on as a craft well into the future. David Preziosi, FAICP, is the executive director of Preservation Dallas.